Electrolysis is a proven method of permanent hair removal. It’s safe, reliable and gentle. Electrolysis permanently destroys each hair follicle individually with a very fine, disposable, sterile needle. The hair follicle can no longer reproduce and this eradicating hair growth on completion of the course of treatments. 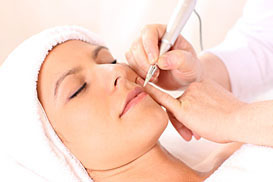 Electrolysis is ideal for targeting individual hairs on the lip, chin and other small areas. We will tailor a treatment plan especially for you. A course of treatments is recommended to achieve a lasting effect. Call us to arrange a consultation where we’ll tailor a course of treatments for you and carry out a complimentary patch test for your safety and well-being.